إن فندق كومفورت إن آند سويتس سيتي فيوز بموقعه الممتاز في هذه المنطقة السياحية هو نقطة انطلاق جيدة لنزهاتك في هذه المدينة المذهلة. يمكن من هنا للضيوف الاستمتاع بسهولة الوصول إلى كل ما تقدمه هذه المدينة النابضة بالحياة. يشكل هذا الفندق ملاذاَ مريحاً للاسترخاء ويمنح زواره فرصة للاستجمام والتجدد، وهو يقع على بعد خطوات من المعالم السياحية الكثيرة للمدينة. استمتع بالخدمات الراقية والضيافة التي لا مثيل لها بهذا الفندق في هذه المدينة رائعة الجمال. يمكن الاستمتاع بمجموعة من الخدمات على أعلى المستويات في الفندق كمثل واي فاي مجاني في جميع الغرف, مرافق مخصصة لذوي الاحتياجات الخاصة, واي فاي في المناطق العامة, موقف سيارات, خدمة غرف. لقد جهزت هذه الإقامة الفندقية بعناية فائقة لتوفر مستوى عالي من الراحة. في بعض الغرف يجد النزيل تلفزيون بشاشة مسطحة, اتصال لاسلكي بالإنترنت, اتصال لاسلكي بشبكة الإنترنت (مجاني), سياسة التدخين - غرف لغير المدخنين متاحة, مكيف هواء. يقدم الفندق مجموعة رائعة من الخدمات كمثل ملعب جولف (ضمن العقار), مسار جولف - ضمن 3 كم, مسبح داخلي، لجعل إقامتك تجربة لا تنسى. إن كومفورت إن آند سويتس سيتي فيوز هو خيارك لخدمة الفنادق الراقية في المدينة. Need to climb staircase. Near Fast-food . Good location. nice and friendly staff. clean rooms. Truthfully the best motel room we have stayed in the entire nation. We stayed two nights to visit Sovereign Hill. 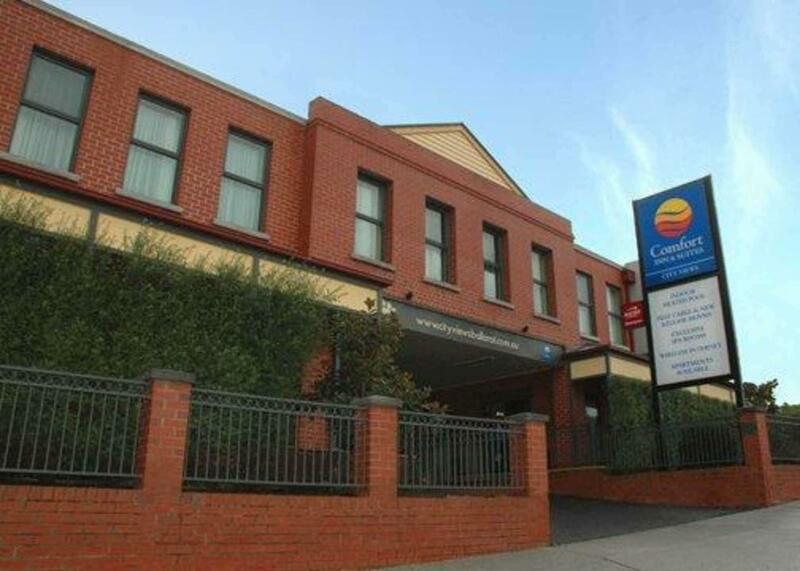 Hotel not near Sovereign Hill but close to centre of town but not in the best area. Rom was clean with good amenities and staff were pleasant. Good stay overall. Breakfast was the only minus point for us as it was very limited. The staff at the reception was very friendly and helpful. It makes a difference when the staff are easy to deal with. Free parking on site is also a bonus. Wifi is free too. Location, cleaniness and size of the room. I stayed here over Christmas 2014 and into the new year, the staff especially the owners could not have been more friendly or done more to make my stay a good one. Had a large room the TV had so many channels there was a mini bar whirlpool bath, room cleaned daily. Across the road a Mc Donald's. bus stop just out side. there is an indoor pool although i did not get to use it. My thanks to you all. Room cleanliness, location, friendly staff. Only back draw are the thin walls. If the neighbours are talking in their room, we can hear them clearly . I totally enjoyed my two night stay at the very well located Comfort Inn & Suites City Views which was close to the mall, shops, cafes and restaurnts. I had a good welcome, the staff were helpful in directing me to various addresses for the events of the Organ Goldfields Music Festival. The room and bathroom were neat and tidy. The bed was extremely comfortable as were the pillows. I highly recommend this place to stay short or long term. Extremely pleasant stay. Room was clean and fresh. Close to all amenities without being in the middle of the city. we had a great stay at this hotel. the location was perfect - across the road from many restaurants and one block from the mall and shopping area. the hotel is right on the street but very quiet. it was extremely hot(rare for ballarat!) and the air-conditioner was on when we arrived hot from a long drive. staff were helpful and pleasant. breakfasts were ordered and extra but good value for money and delivered right on time.i would highly recommend this hotel.